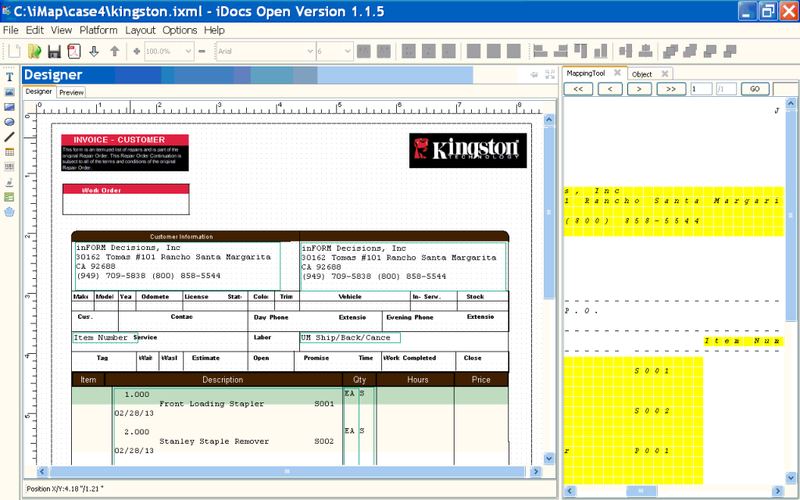 iDocs Designer is an evolution of 20 years of document design tool, and user interface experience. Through the years, each new version of IFD’s designer has simplified the forms design process while increasing the flexibility to create and communicate more. iDocs Designer works with both the IBM iSeries native iDocs as well as inFORM’s iDocs Open Platform Document Management solution. iDocs Designer allows you to create any business form, MICR check, report, scalable and three dimensional barcode and Chinese (Unicode) characters (or DBCS double byte). COLOR Document Support is built in as well as support for XML and encrypted PDF formatted documents for both the open platform and the IBM iSeries. Users can draw rectangles, ovals, text boxes, fonts, MICR fonts, scalable barcodes (including QR codes), and import multiple graphic formats. Properties can be applied to any drawn object, including fill, size, borders, colors and textures. Depending on the platform iDocs Designer will work with a GUI (Graphical User Interface) mapping tool to map data from a print or spool file onto the designed form, which will store this information for ongoing form-data merge operations (see iDocs and iDocs Open). Print files or IBM spool files can be downloaded into the right pane to be dragged and dropped into appropriate locations on the form. Multiple properties can be applied to the mapped data, including fonts, routing conditions, colors, burst and sort conditions, object and signature merges and more.